Judges 15:8 He struck them hip and thigh with a great slaughter: and he went down and lived in the cleft of the rock of Etam. Judges 15:11 Then three thousand men of Judah went down to the cleft of the rock of Etam, and said to Samson, "Don't you know that the Philistines are rulers over us? What then is this that you have done to us?" He said to them, "As they did to me, so have I done to them." (1) Mentioned in Septuagint along with Tekoa, Bethlehem and Phagor (Joshua 15:59). In 2 Chronicles 11:6 it occurs, between Bethlehem and Tekoa, as one of the cities built "for defense in Judah" by Rehoboam. Josephus writes that "there was a certain place, about 50 furlongs distant from Jerusalem which is called Ethan, very pleasant it is in fine gardens and abounding in rivulets of water; whither he (Solomon) used to go out in the morning" (Ant., VIII, vii, 3). Mention of `Ain `Aitan, which is described as the most elevated place in Palestine, occurs in the Talmud (Zebhachim 54b), and in the Jer. Talmud (Yoma' 3 fol 41) it is mentioned that a conduit ran from `Atan to the Temple. The evidence all points to `Ain `Atan, the lowest of the springs supplying the aqueduct running to Solomon's pools. The gardens of Solomon may very well-by tradition, at any rate-have been in the fertile valley below `Urtas. The site of the ancient town Etam is rather to be looked for on an isolated hill, with ancient remains, a little to the East of `Ain `Atan. 1 Chronicles 4:3 may also have reference to this Etam. 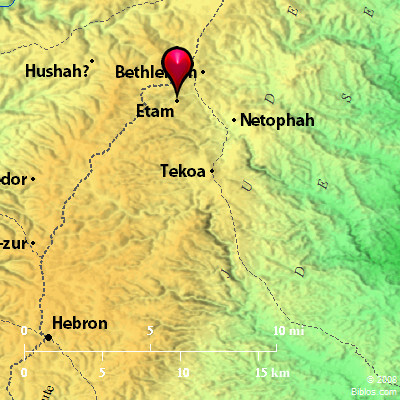 (2) A town assigned to Simeon (1 Chronicles 4:32). Mentioned with EN-RIMMON (which see), identified by Conder with Khurbet `AiTun in the hills Northwest of Beersheba. (3) The rock of Etam, where Samson took up his dwelling after smiting the Philistines "hip and thigh with a great slaughter" (Judges 15:8, 11), was in Judah but apparently in the low hill country (same place). The rocky hill on which lies the village of Beit `Atab, near Sur`ah (Zorah), was suggested by Conder, but unless (3) is really identical width (1), which is quite possible, the cavern known as `Arak Isma`in, described by Hanauer (PEFS, 1886, 25), suits the requirements of the story better. The cavern, high up on the northern cliffs of the Wady Isma`in, is a noticeable object from the railway as the train enters the gorge. E'TAM, the name of both a town and a rock, the former supposed to be 7 ms. s.w. of Jerusalem and the rock at the rock cavern at Beit Atab, 9 ms. w. by s. of Jerusalem.